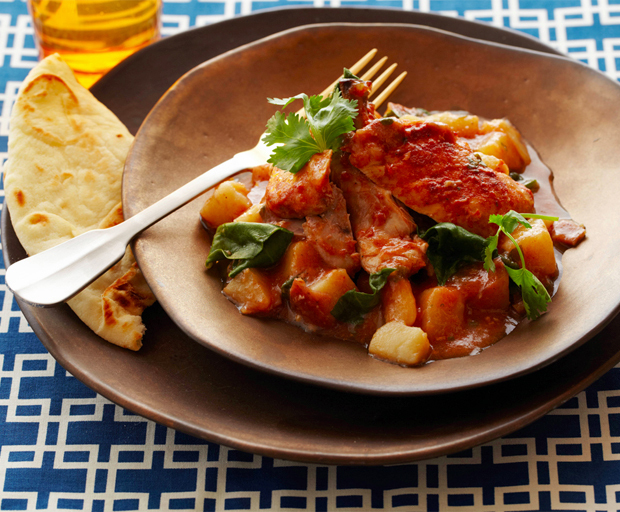 Forget takeaway, Callum Hann’s chicken curry recipe is now one of our weekly easy dinner ideas. 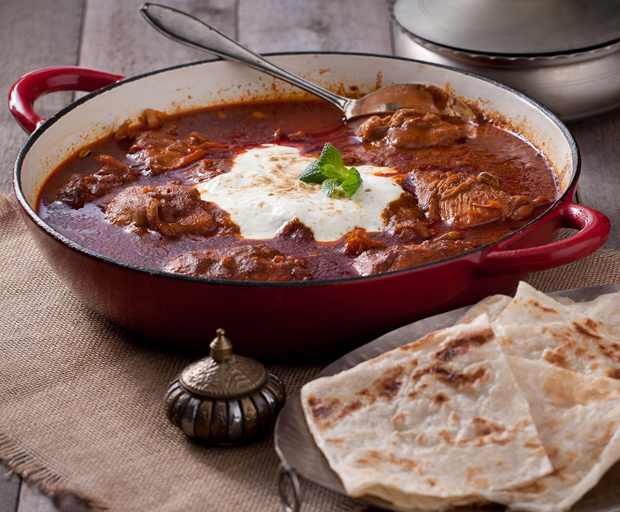 Serve with rice, fluffy naan and his singly tzatziki for the ultimate curry night. Korma is one of those please-all Indian curries. Everyone (except vegetarians), will pounce on a big bowl of this chicken one, and even then you could swap the chicken out for sweet potato or pumpkin (winter squash). Prepare for your kitchen to smell delicious. The green apple I’ve added to the tzatziki gives it a little extra zing. 1. In a large bowl, stir together the yoghurt, garlic, ginger, coriander stems and 2 teaspoons of the garam masala. 2. Cut each chicken thigh into nine pieces then stir into the yoghurt mixture, cover with plastic wrap and marinate in the fridge for at least 30 minutes, or ideally for 1–3 hours, if you have time. 3. If you are making rice, start it just before you start cooking the korma. 4. Heat a large heavy-based saucepan over a high heat. Add the canola oil, then the onion and capsicum and stir for 3–5 minutes, or until the onion starts to turn golden brown.Add the tomato paste,curry powder, salt and the remaining garam masala, and cook for a further 2–3 minutes, stirring frequently, before adding the chicken and yoghurt mixture. 5. Cook for 8–13 minutes, stirring often, or until the yoghurt has started to brown and the chicken has just cooked through (piping hot flesh with no sign of pink in the juices).Turn the heat off. 6. Meanwhile, make the tzatziki (omitting the dill in the recipe). Roughly chop half the coriander leaves and stir them through the tzatziki with the grated apple. 7. Stir the frozen peas through the korma.The second they have warmed through in the korma, put the taztziki in the middle of the table with the rice or naan bread. 8. Scatter over the remaining coriander leaves and flaked almonds (if using) and serve. What’s your favourite curry dish? 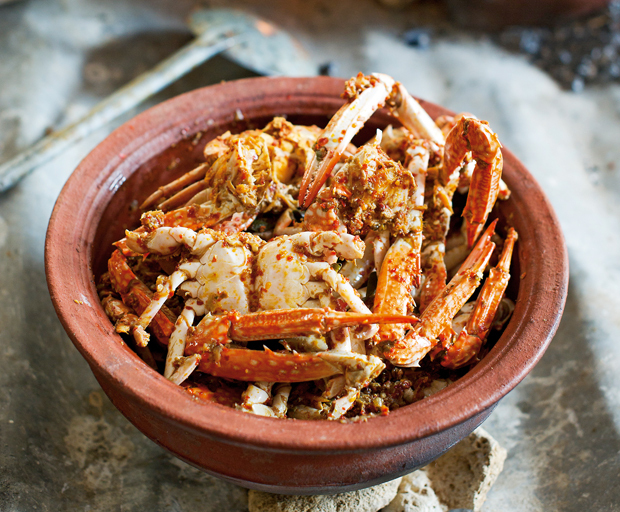 Curries don’t have to take hours to cook, in fact this Sri Lankan crab curry recipe is one of our favourite quick dinner ideas, taking less than 30 minutes to make, and that includes making the aromatic curry paste from scratch. Jaffna is renowned for its abundant seafood and a visit to the region isn’t complete without tasting their famous crab curry. We cooked the curry over an open fire in Bamini’s garden and the flavours were incredible! 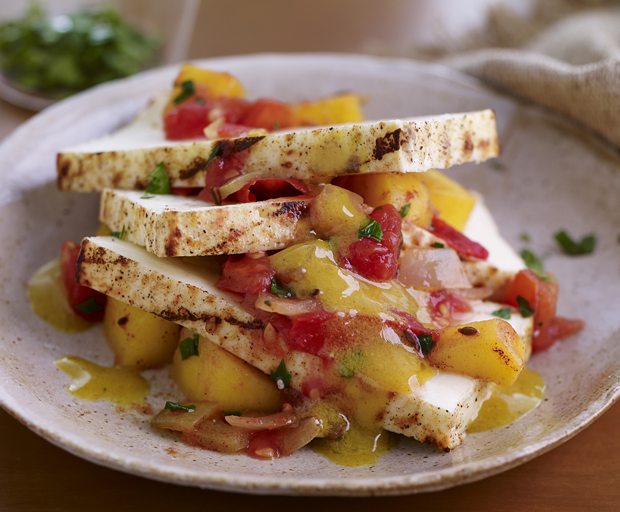 Be prepared to get a bit messy when eating this dish, but I can assure you it is worth it. 1. If using live mud crabs, place them in the freezer for 1–2 hours until they are completely immobilised before you begin chopping them. 2. Remove the triangular flap under the crab and discard it, then lift off and remove the head, keeping the head to cook with the rest of the crab for presentation. Remove the gills and any yellow ‘mustard’. Wash the crabs. Cut in half, then pull off the big claws. Using the back of a large knife, tap the claws to crack them; this allows the flavours to seep in while cooking. Wash the crab pieces and set aside. 3. Using a mortar and pestle, pound the garlic, ginger and salt into a paste. Heat the oil in a large wok or heavy-based saucepan and cook the onion over medium heat for 3 minutes. Add the chillies and the garlic and ginger paste and cook for 1 minute. Stir in the tomatoes, fennel seeds, fenugreek seeds, dried chilli pieces and chilli powder; cook for 1 minute. Add the coconut milk, curry leaves and crab pieces; simmer for a further 10 minutes, or until the sauce has thickened and almost completely reduced, making sure to turn the crab regularly. Remove from the heat, add the lime juice and season to taste with salt. Who doesn’t love butter chicken, but instead of ordering one from your local takeaway (with that appetising layer of oil on top! ), making your own couldn’t be easier or healthier. This recipe uses Greek yoghurt in the aromatic sauce instead of fattening cream and you wouldn’t notice the difference (well, your hips will!). It might look like a lot of ingredients, but don’t let that put you off, as you’ll have most of them in your pantry already. Look for organic chicken thigh cutlets which taste so much better, and don’t forget to serve with warm naan or roti for dipping into the beautiful brick-red sauce. 1. Marinate chicken with garlic, garam masala, coriander, cumin, chilli powder, paprika and yoghurt overnight (or for least 2 hours). 2. Melt butter in a saucepan over a medium heat and cook chicken until browned. 3. Add cardamom pods, vinegar, chicken stock, cinnamon, tomatoes, tomato paste and mix well. Bring to the boil then simmer for 40 minutes (or until the sauce starts to thicken). 4. Stir in five:am Greek Style organic yoghurt and simmer for a further 5-10 minutes. 5. Serve chicken with steamed rice, naan or roti bread for dipping. 1. Dust chicken with a little flour and cook in butter until browned. 2. Remove chicken from pan and brown spices until fragrant. 3. Stir in remaining ingredients, including chicken and bring to the boil. 4. Cook over a low heat for 1 hour, stirring occasionally. 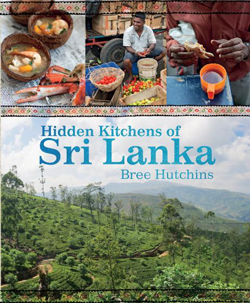 What’s your favourite Indian recipe? My Kitchen Rules winners Dan and Steph have been trimming down – losing over 20kgs in 7 weeks combined! How did they do it? They’ve been on the Bodytrim system and they’re sharing another of their favourite Bodytrim recipes, a quick dinner idea that’s probably one of your stand-by takeaway meals, but now you can make it in less time – and healthier – than your favourite Indian restaurant. 1. Cut chicken breast into small strips. Heat sesame oil in a wok or frying pan, and fry chicken, garlic and ginger for 3-4 minutes. 2. Stir in coconut milk, tomato puree, curry paste and vegetable stock and simmer for a further 4-5 minutes. 3. Drop whole tomatoes into boiling water for a few seconds, refresh in cold water, then skin, quarter, de-seed and cut into wedges. 4. Add tomatoes to the chicken curry a few minutes before serving. 5. Stir Thai basil and coriander into curry and season with lemon juice, salt and pepper. What’s your favourite curry recipe? Who doesn’t love an authentic curry? Ditch the greasy takeaway and whip up this delicious easy beef curry for dinner tonight. It’s a hearty and aromatic curry recipe with just the right amount of spice, and is ready in less time than it takes to get delivery! 1. Brown onions in oil. Add cubed round steak and brown well. 2. Add curry paste, 1 tablespoon Gourmet Garden Coriander and cook for 1 minute. 3. Stir in canned tomatoes, beef stock and coconut milk. 4. Simmer for 45 minutes to 1hr, or until tender & stir in 1 extra tablespoon of Gourmet Garden Coriander. Serve with rice, pappadams and chutney. 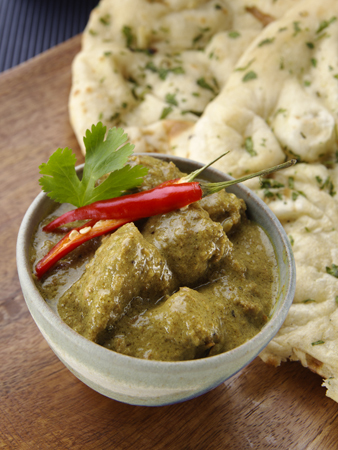 What’s your favourite Indian curry?